Quinn became a member of our guiding team 2 years ago, after graduating from the Mountain Adventure School program. 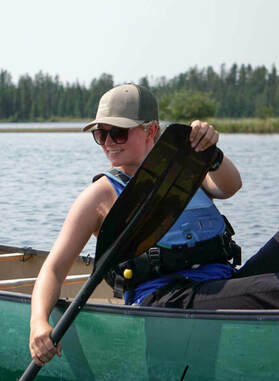 She has been a lifelong lover of paddling, hiking, biking and world travel. During the off season, Quinn studies Engineering at the U of A, and coaches both swimming and cross-country skiing lessons. Through school and travel she has become conversationally fluent in both French and Spanish. By working at HeLa Ventures, Quinn hopes to inspire a love for outdoor adventure in everyone she works with.